Discover who lives in the neighborhood when you visit a freshwater pond, a saltwater beach, an urban woodland, and a community garden. At the freshwater pond, get a "fish-eye view" when you crawl inside the pond aquarium to watch fish and turtles swim among aquatic plants. Special cameras and listening devices let you be field scientists, watching and listening for animals hidden throughout the diorama. Running near the pond is a stream, which cascades down a series of waterfalls. Along the stream, you can find fish, muskrats, raccoons, and birds—and see how animals interact with and depend on water. In the community garden, dig, plant, and harvest play plants. Become an environmental DJ by mixing the unique rhythms of man-made and natural outdoor sounds at the a kid-friendly mixing board; or climb inside a hollow log in the urban woodland to get an up-close look at underground organisms and live toads, snakes, and turtles that live in the forest. With help from Museum educators, you can touch live horseshoe crabs and sea stars at the tide pool in the saltwater beach. Create your own marine animal models and test how they move in the wave pool; or in the sandy dunes, sift for clues to marine life in the area and then check nearby specimen samples to identify what you’ve found. Nearby, the Greenhouse and outdoor Garden are filled with common and exotic live plants, insects, and animals—see how many you can find! In the Science Inquiry Center, you can find field guides and other resources for eco-adventures in your own neighborhood, or say "hi" to Fantasia, the Museum's famous, 20-foot-long albino Burmese Python. NYC & Me: A Little Bite of the Big Apple is a new interactive gallery that captures the quintessential sights, sounds, flavors and spirit of New York City. Inside this 3,000-square-foot immersive experience children take over the Big Apple’s sidewalks, streets, parks, plazas, public transportation, air rights and underground world as they playfully explore the city that never sleeps. • Put on uniforms and take over the city, becoming traffic officers, bus drivers, taxi drivers, food cart vendors, park rangers, construction workers – and even mayor. Whether they are directing traffic, handing out building permits, adding traffic cones or cleaning up dog poop and trash, there’s always something to do in this busy city. • Add to the city skyline as a construction worker – move blocks to an elevated construction area via conveyor, walk on I-beams, and slide to the ground when done. Beneath the construction site, tiny utility workers crawl past miniature dioramas of the city’s support systems, a network of walls, columns, cables and pipes maintained by a whimsical team of city rats. • Act as chefs as they serve up their own New York specialties at the international Taste of NYC Food Cart. • Ice skate in socks to seasonal music! The Rink in Central Park is a winter tradition for New Yorkers and tourists alike. • Dance inside a soundproof laser tunnel behind Times Square to create music from the ambient sounds of the city. • Explore NYC stories from the steps of the NY Public Library, between Patience and Fortitude. The library collection will feature great children’s books about city life. • Sing, dance and perform as a street performer. Let the budding musicians and dancers shine! • Take the NY Minute Challenge – Get the most out of every minute. The challenge will turn the city into a uniquely New York obstacle course where kids can choose among crazy challenges, such as issuing a speeding ticket while schlepping pizza boxes. A full range of complementary weekend workshops, programs and performances will occur throughout the gallery’s four-month run to introduce children to the best of the city’s arts through CMOM’s Gateway to the Arts initiative. NYC + Me is funded by The Laurie M. Tisch Illumination Fund. Our newest location updates PS 321's fabled tradition of antiques and vintage vendors in the Seventh Avenue schoolyard, combining familiar and new Flea faces. Expect about 30 vendors every Saturday and Sunday, including five or so food vendors, and treasures of all kinds to pore over and sift through. Vintage clothes on monkey bars? Got 'em. Jumbles of jewelry on the jungle gym? Yup. We’ve designed every aspect of PlayWorks™ to help families prepare children to enter school ready to learn and grow. 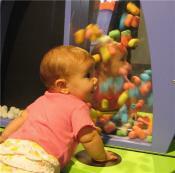 By combining play and learning, PlayWorks™ creates a fun and rewarding experience for children. As children explore PlayWorks™ and participate in daily Art Lab programs, they build their physical, social, math, art, science, literacy and problem-solving abilities—as well as the self-confidence, independence and awareness necessary for them to become life-long learners. For adults, PlayWorks™ provides an opportunity to observe each child’s unique learning style and appreciate how play creates a strong foundation for later learning. This innovative 4,000 square foot environment includes Alphie—a giant talking dragon who “eats” letters, a deli, a fire truck, MTA bus, sand play, giant lite brite, soft space for crawlers and more! Opening June 28, Red Grooms’ New York City continues CMOM’s focus on exhibitions of prominent artists. Grooms has had a prolific career as a painter, sculptor, printmaker, filmmaker and theater designer. His work reflects the City’s frenetic energy, exuberance and playfulness through a visually stimulating, layered approach. Thought-provoking and whimsical for adults and children alike, the exhibition highlights CMOM’s commitment to provide families with access to fine works of art early in life and exposure to the art-making process. Collateral material will provide children and families with a behind-the-scenes look at the artist’s planning and conceptualization of his work. The specially selected pieces for this exhibit help children understand the many different ways of seeing their world and environment. Join BBSC every Sunday for our Skate Clinics. These are group, drop in lessons for students of all skill levels, from beginners, to more advanced students who want to tighten up their skills or learn new tricks. Need board? Helmet? Pads? You can simply rent ours. 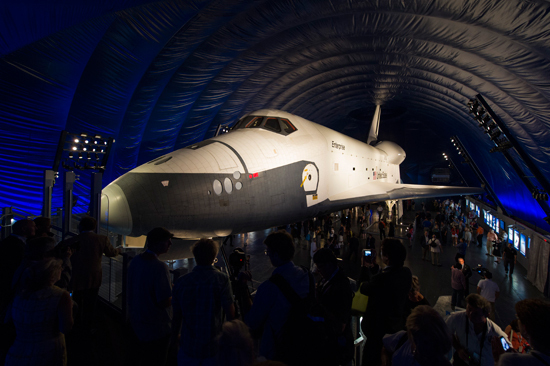 Within the Intrepid Museum’s Space Shuttle Pavilion, Enterprise sits just 10 feet off the ground, allowing visitors to walk directly underneath this historic artifact, while an elevated viewing platform allows guests to gain even greater perspective. Striking images, descriptive texts, dramatic lighting, and immersive video experiences reveal the space shuttle orbiter as both experimental space plane and space ship, and a vehicle that enables a greater understanding of science and technology. The Space Shuttle Pavilion has been engineered to express the shuttle program’s stories of human triumph and technological feats. Enterprise was NASA’s very first space shuttle and the inspiration and prototype for the shuttles that followed. Space Shuttle Enterprise would never have soared without the people who made this great aerospace creation a reality. The Pavilion emphasizes the story of the Enterprise as the 1976 prototype space shuttle orbiter and illuminates its relationship to NASA’s historic role in experimental aircraft throughout the twentieth century, along with NASA and commercial plans for future space missions. Intrepid Museum is proud to be one of the few places in the world to provide the opportunity for visitors to get an up close view of a space shuttle. As you near the exit of the pavilion, please look for our Project Enterprise wall where you can learn about the future permanent home of Enterprise. This interactive wall showcases those who have Sponsored a Star and supported our future plans for Enterprise, providing the opportunity for Intrepid Museum to build a thriving center for science, technology, engineering and math education programs designed to inspire future scientists, engineers and researchers. Step inside Building Brainstorm and you'll find a kid-friendly studio environment inspired by the philosophy and aesthetic of mid-century designers Charles and Ray Eames. Filled with architectural plans, photographs, models, and authentic building elements, the show features interactive workbenches and job sites that equip diminutive designers to brainstorm creative solutions for architectural and engineering challenges. Kids will discover the basics of buildings while exploring the process of creating structures that match the needs of the people inside them. STEAM education (Science, Technology, Engineering, Art and Math) and essential 21st-century skills will be taught through a variety of guest scientists, engineers, educator-led programs and independent exhibit activities. Each open-ended maker activity is inspired by the Do It Yourself (DIY) movement allowing children to experiment with technologies, test out scientific principles and think critically and creatively. Kids will build robots, create a simple circuit out of food-safe dough and use littleBits electronic blocks to make their ideas come to life. Brain challenges and Keva blocks supplement the activities and invite families to use their imagination in a variety of different ways. A special Makers' Festival featuring scientists, engineers and artists will also take place in the space during Spring Break (April 12–22). Justin K. Thannhauser (1892–1976) was the son of art dealer Heinrich Thannhauser (1859–1935), who founded the Moderne Galerie in Munich in 1909. From an early age, Thannhauser worked alongside his father in the flourishing gallery and helped to build an impressive and versatile exhibition program that included the French Impressionists and Post-Impressionists, the Italian Futurists, and regularly featured contemporary German artists. The Moderne Galerie presented the premier exhibitions of the New Artists’ Association of Munich (Neue Künstlervereinigung München) and The Blue Rider (Der Blaue Reiter), both of which included Vasily Kandinsky, in 1909 and 1911, respectively. Kandinsky later described the gallery’s rooms as “perhaps the most beautiful exhibition spaces in all of Munich.” The Moderne Galerie also mounted the first major Pablo Picasso retrospective in 1913, thus initiating the close relationship between Justin K. Thannhauser and Picasso that lasted until the artist’s death in 1973. An ambitious businessman, Thannhauser opened a second gallery in Lucerne in 1919 with his cousin Siegfried Rosengart (1894–1985). Eight years later, the highly successful Galleries Thannhauser—as the Munich and Lucerne branches were collectively called—tested the waters in Berlin with a major special exhibition before permanently relocating its Munich gallery to this thriving art center. Business operations were nonetheless hindered throughout the next decade due to increasing anti-Semitism in Germany and a National Socialist (Nazi) government bent on purging the “degenerate art” of the avant-garde. The Galleries Thannhauser officially closed in 1937, shortly after Thannhauser and his family immigrated to Paris. Thannhauser eventually settled in New York in 1940 and, together with his second wife, Hilde (1919–91), established himself as a private art dealer.